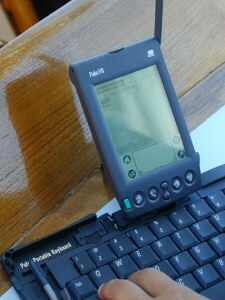 This page will list some of the times I see others using the Stowaway keyboard in interesting ways. 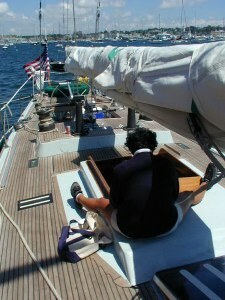 During lunch on a day sailing in Newport, Rhode Island (see "Sailing in Newport"), I noticed one of the crew members on the Columbia 12-meter America's Cup racing yacht sitting on deck, using a Stowaway keyboard with a wireless Palm VII. She said she used it all the time. The idea of a picture of a "stowaway" next to the opening to the hold of a boat where people who are stowaways hide was one I couldn't pass up. I asked permission for posting the pictures and asked if she wanted her name used. She said "yes". Not having a pen, I asked if she'd send me an email and I'd send her the URL when I used it. You can see her typing it in above. you using one of these keyboards at one of the conventions he attended. So, this really wasn't completely a "Stowaway in the wild", unconnected to me using it. Alain is a fellow trustee of the Massachusetts Software and Internet Council. We've seen each other at board and subcommittee meetings a lot. It was yet another example of how word of mouth, or "I'll get what you get", works in the high-tech toy world. I found another write-up of the Stowaway on Hugh Peeble's Hugh's News June 2000 page. I'm having trouble imagining how Think Outside (www.thinkoutside.com) could significantly improve the Stowaway keyboard, a pre-release version of which I used for this test. (The Stowaway is already available for the Palm and Handspring handhelds.) As a writer who's used keyboards for years, I tend to think through my fingers. A full-sized keyboard is as essential a part of my toolkit as a word processing software or screen. With this keyboard and computer, I can even work productively in the most cramped airplane coach seat, something that's impossible with my notebook machine. test files for a new hypertext tool. a picture of my note-taking in his photojournal of the conference. The keyboard fits nicely on folding lecture-room writing surfaces. and both times it came through unmarked.